The letter comes in the wake of an allegation of sexual misconduct raised against Judge Brett Kavanaugh, a 1983 graduate of Georgetown Preparatory School in North Bethesda, Maryland, who has been nominated to serve on the U.S. Supreme Court. On Sept. 16, Christine Blasey Ford, an alumna of Holton Arms School in Potomac, Maryland, accused Kavanaugh of sexually assaulting her at a party about 36 years ago when she was a 15-year-old high school student. Over the weekend, a second allegation of sexual misconduct was raised against Kavanaugh, dating to his freshman year at Yale University. Kavanaugh, who serves as a judge on the U.S. Court of Appeals for the District of Columbia Circuit, strongly denies both claims. In the weeks that have followed the first accusation, news reports have come out about excessive drinking and sexual misconduct by students of Georgetown Prep in the 1980s. In his Sept. 20 letter, the school’s president, Jesuit Father James Van Dyke, noted that it is a “challenging time” for the school in light of all of these reports. In this time, the school particularly hopes to help them to develop “a proper sense of self and a healthy understanding of masculinity, in contrast to many of the cultural models and caricatures that they see,” said Father Van Dyke. Father Van Dyke noted that he is proud of the faculty and staff of the school, who serve as role models and dedicate their time and effort to teaching their students these lessons. 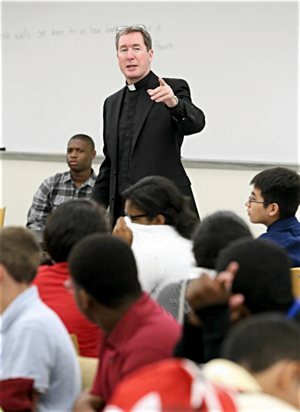 But he denied the accusation that the school is entitled or uncaring because “one of the most important lessons we strive to live and to teach our students is an ethic of service and compassion and solidarity with those in need,” emphasizing that this turbulent time asks them to renew their commitment to these qualities. “I know that our school and its community is well prepared to and committed to help these young men to become most truly men of faith and men for others,” Father Van Dyke said. Sankowski is a reporter for the Catholic Standard, newspaper of the Archdiocese of Washington.